Waffles have become a staple in my diet ever since I got a waffle maker a few months ago. Luckily I've found a way to make them vegan, gluten-free and refined sugar-free so I can enjoy them safe in the knowledge that they're cruelty-free and they won't hurt my sensitive stomach. It also helps that they taste amazing and are pretty awesome for your body too! I like adding protein powder to mine to keep me going all morning but that's definitely optional. Make the flax eggs by mixing the ground flaxseed and the water in a small cup. Set aside. Grease your waffle maker with a small amount of coconut oil (if needed) then preheat it. I use setting 2 on mine which is the equivalent of 2 minutes preheating time and 2 minutes cooking time. Add the flour, baking powder and cacao/protein powder into a mixing bowl and stir them together. Mix in the milk and flax eggs then add the coconut sugar to taste. The batter should be very thick at this point. Once your waffle maker has preheated (mine beeps to tell me it's ready!) pour the mixture into it, close the lid and leave it to cook for a couple of minutes (again, mine beeps once it's done). Once cooked, remove the waffle and serve it with whatever you like - I recommend berries, maple/rice syrup and nut butter. Enjoy! 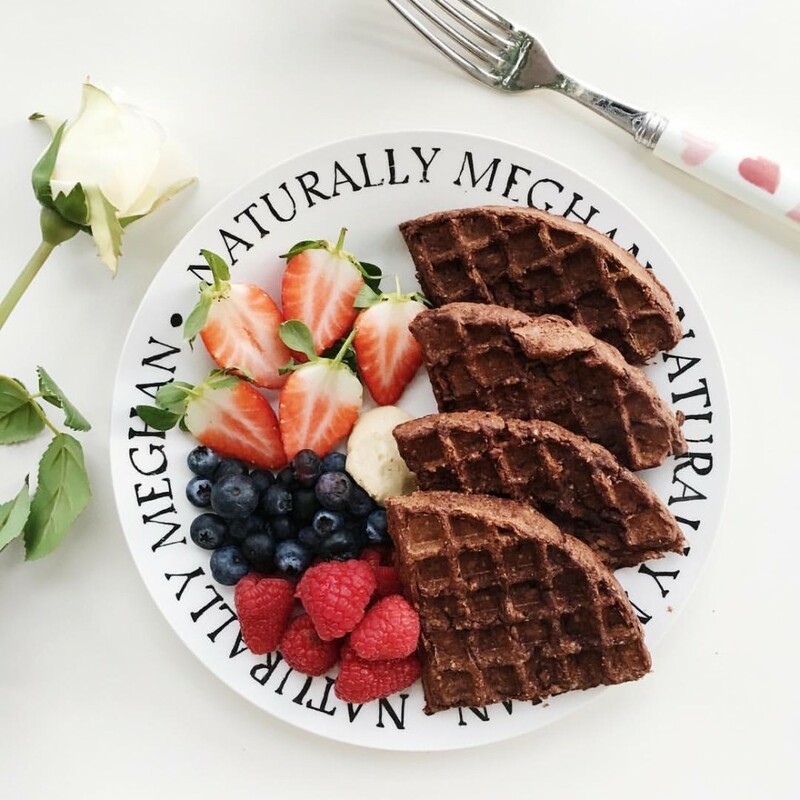 Wow these look amazing Meghan, I need to get myself a waffle maker and try these soon! Thank you Simos! You definitely should, waffles are such a quick and easy breakfast to make!